Clothing stains are probably the most common type of stain you encounter during your day, and sometimes they can be the worst to clean up. Even when you buy the expensive cleaning products from the store, they sometimes don’t have the power to get the stain out if with all their harsh chemicals. 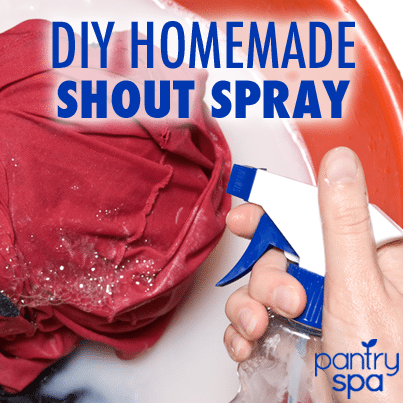 If you are the type of person who is cleaning stains off clothes all the time (yes, we mean mothers) then this homemade recipe of Shout will be right up your alley. This recipes works wonders to get the stain out, it hardly costs anything (around $2 for everything ) and it contains no harsh chemicals. Getting stains off clothing is a daily battle for most mothers, and the best way to keep costs down is making your own cleaning products, like this DIY Shout. Mix all the ingredients together and pour into a spray bottle. Before using, shake the bottle vigorously. Do not worry if the ingredients separate after it has been sitting for a while. A good shake will mix everything back up. Spray the mixture on the stain and allow the mixture to soak in for a few minutes. If the stain seems to lighten pretty easily, wash the clothing how you normally would. If the stain is still there, use a rag to rub the Shout mixture into the stain. It should begin to become less visible. Some people have complained the baking soda is clogging their spray bottle, which is an annoying hassle. Try adding a small amount of dishwashing soap to the mixture to make it come out more smoothly. If you like the recipe how it is, try putting it all in a squeeze bottle instead of a spray bottle.